This is a tribute to all the keepers of the old and historical mill buildings of Ontario. Whether for restoring these great old buildings back to mill operations or saving them for private or public use, thank you from the 2oldguyswalking team. Seems the Rangers attraction to these rare old buildings might be influenced by the fact that he was born and raised in a former millhouse. This post will update our readers on new information on a few of our favorite mills since our original posts about them. The original posts may be accessed by the links included. On taking control of this property in 1967 when the mill ceased operations, the Otonabee Region Conservation Authority was about to destroy one of the oldest mills in the area. The residents of Millbrook were not about to have this happen to the heart of their community. The citizens of the town rallied together and the property was leased to a building supply company in 1972 until the death of the owner in 1978. Again the mill was in jeopardy. By 1984 a Save the Mill Committee was formed to save the building and with major repairs was successful in saving the mill yet again. By 2015, the building was once again in danger of loss due to its many structural issues and deemed unsafe for public use. The Millbrook Historical Society purchased the mill a year later from its owner the Otonabee Conservation Authority (ORCA) for the cost of $1 after agreeing to begin a campaign to raise the $90,000 to bring the building to proper safety standards. Pollard the Mover, from Lindsay, Ont. raised the mill from its crumbling foundation and it sat on steel rails for some time. Recently a new concrete foundation was poured and the building was moved about fifty feet east of its original location to a new cite near the mill pond dam. The next step is to sign a lease agreement between Monaghan and Cavan Historical Society, ORCA and the Federal Government, a process that could take several months. The last step is to address the cosmetic repairs to the outside of the building including skirting and applying a new coat of paint to the building. These repairs are to be accomplished with volunteer labor and could take until late 2017 for the project to be officially completed. Seems Millbrook will live on with its mill. Once the again the residents and public will have the chance to appreciate and to enjoy the ‘heart’ of the Millbrook community. Many Thanks from the 2oldguys to Monaghan and Cavan Historical Society for their untiring efforts in saving this mill more than once. 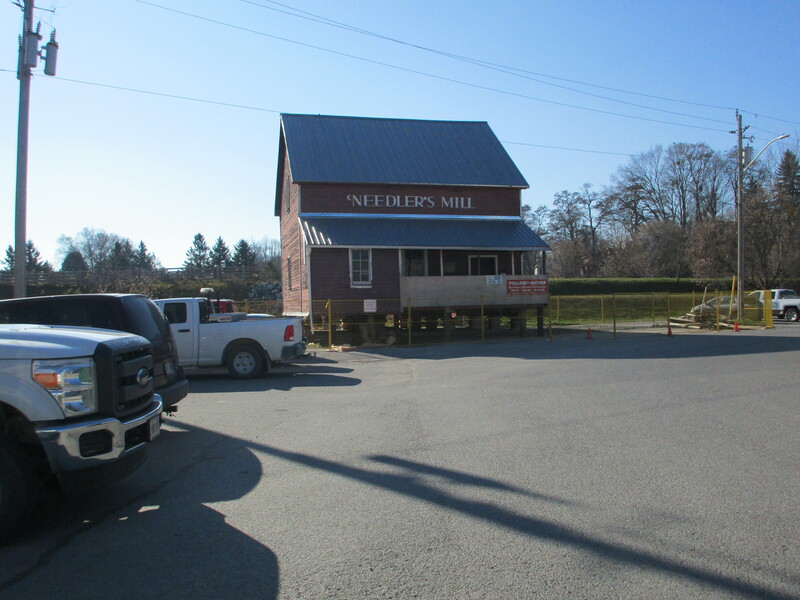 The original building on this lot started out in 1795 as Keeler’s Mill, a saw mill on Piper Creek in Castleton and was at some time likely destroyed by fire. The current mill building was erected around 1820 and was powered by water from the mill pond. In 1870, Samuel Purdy started the Purdy Milling Company. An interesting note here, according to the 1878 Illustrated Northumberland & Durham Atlas (Beldon) it was called the Castleton Flour Mill. The original flour mill operated until 1900 at which time it was converted to a feed mill. The Purdy family ran the business until 1948 and it has had several owners since. In 2011, the twenty acre mill site and mill house were purchased by Mitchell & Candace Cox and an old barn has been lovingly restored and plans are to restore the mill building for a new use as a community venue. Now that several years of legal problems regarding a boundary dispute regarding the mill property line has been settled, it is expected we will soon see great changes in this building. The mill is now called the Piper Creek Mill and will be used as an arts and heritage centre for music, fine and theatre arts. The 2oldguys thank the mill owners for their time, labor and resources to eventually bring this beautiful old building back to life for many more generations to enjoy. This old mill started its life in 1850 as a planing mill, powered by a water wheel in what was called Campbells Ont. Its dam would have been one of about thirty eight along the Ganaraska River from Osaca to Port Hope. The mill was one of three in the Garden Hill/Campbellcroft area at one time. It is the last in Northumberland County to operate with water turbine power with the possibility of electrical generation. Some name changes over the years include Banister, Desalvo, and Fudge’s Mill. The current owner Dominic, purchased the mill in 2013 and has named it the Campbellcroft Mill. The mill operates part time offering seed cleaning and sales. The mill was constructed in a utility style of heavy wooden beams and planks. For many years galvanized steel has clad and protected the building from the elements…imagine what the mill would look like without it! The mill owner has, at great personal expense and labor upgraded the warehouse section, replacing aging footings, floor and roofing. Some dam repairs have been completed and other equipment restored. You had us concerned a few weeks ago when driving past the mill pond and seeing it drained. With the new stoplogs in place the pond is now back to normal. One of the largest expenses now faced is replacing the leaking old tar covered metal roofing on the main section of the mill. This is a priority to prevent any more water damage in the buildings interior. The mill owner with a fulltime job and limited resources has a big dream. Dominic’s dream is to awaken the ‘sleeping giant’ of a mill and turn it into a living history museum complete with water wheel power. The 2oldguys are really looking forward to seeing the mill equipment once again working. Thank you Dominic, your mill will be a great asset to Campbellcroft, Port Hope and the County of Northumberland.